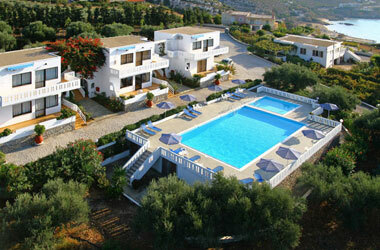 Villas Michalis are located in Chorafakia, on the Akrotiri Peninsula, close to Chania. They are set on a plot of 8.500 sq m very close to the sea. Each villa has its own balcony surrounded by beautiful gardens with stunning views of the blue Cretan sea. The whole plot is surrounded by olive and pine trees including a productive vineyard. There are two types of Villas, 8 in total. Types (A) are 6 villas of two bedrooms of 50 sq m each and accomodates 2-5 persons. Types (B) are two villas of two bedrooms each of 100 sq m and accomodates 2-6 persons each. There is a magnificent swimming pool of 100 sq m and a childrens swimming pool of 26 sq m.
Private parking for our holiday makers. In case you would like to rent a car, we can help you. We are happy to provide you with a price list and models available on request.